Indoor rock climbing is a wonderful form of exercise that will challenge you both physically and mentally. Our wall is 30 feet tall with 7 rope stations and the possibility of thousands of hold combinations to ensure your climbing experience will never be the same. The climbing wall is located in the Wellness Center facility. Push your limits climbing one of the many great routes on the wall while being belayed by our knowledgeable and helpful staff. For you first time at the wall, you will need to fill out our waiver form before you begin climbing. Bouldering (climbing up a fixed height with no ropes) and the two autobelays on the wall are completely free to use whenever the wall is open. If you would like to climb any of the roped routes, you are required sign up for the Skills Class or Skills Challenge Test and pay a $5 fee which includes the class/test as well as climbing membership for one year. More information about the Skills Class at test can be found by clicking the "What is the Skills Class and Skills Challenge Test" tab below. Make sure to wear comfortable clothing that allows for range of movement such as athletic clothes. We provide all the equipment you will need to climb including a harness, shoes, belay device and carabiner. You may also bring your own personal gear for use. What is the cost to climb? If you take on campus classes then the cost to climb is included in your student fee’s. All you need to access the facility is your UNK ID. 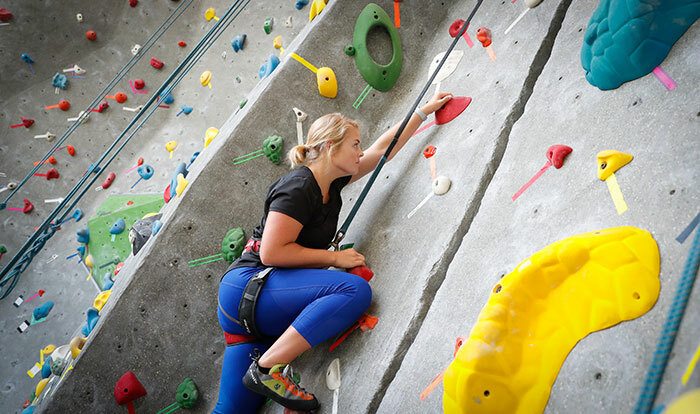 Students that do not pay the Wellness Center student fee’s must pay for that membership ($57/semester) to also have access to the Climbing Wall. Faculty, staff and affiliates that would like to use the wall must have an active Wellness Center membership to use the Wall. Current Wellness Center members are allowed to sponsor guests to use the wall. The cost is $5 per guest per visit. More information on guest passes can be found in the Guest Passes drop down on our Wellness center page. Are you ready to enter the world that is rock climbing? Learn the skills to effectively manage risk, both as a climber and belayer. The class will teach participants the fundamentals of indoor rope climbing and the techniques to manage risks that are inherent to climbing. Techniques include: tying in to the rope, setting up a belay device, how to manage slack as a climber ascends, and how to lower the climber back to the ground. Skills Class cost is $10 and takes around 1 hour to complete depending on the size of the class. Click the link below and search for open classes under the Climbing Wall section. Please show up to your scheduled class at least 5 minutes early with your student ID ready. If you already have the skills to pass a belay course, ask your instructor if you can take a challenge test. Cost to participate is $25. All participants will receive a t-shirt and opportunity for prizes. Open to all skill levels. Want to host your next student group gathering, staff development training or birthday party at our climbing wall? Our Climbing Center is a great place to take a group of people looking to have fun, experience something exciting and learn more about themselves and the group. No previous climbing experience needed to have a great time! All participants must be at least 5 years of age and complete a climbing wall waiver. Maximum 15 climbers at a time. Arrangements can be made for groups larger than 15. Exclusive access to the wall. Each group is required to have a 15-20 minute safety instruction prior to climbing. Staff dedicated specifically to your group’s event. Reservations must be made at least 14 days in advance. Advance notice increases probability of fulfilling your request. When submitting a reservation request, you are encouraged to provide 3 different day and time preferences. Minimum one hour needed, per 15 climbers. To accommodate groups larger than 15, additional planning may be required; including but not limited to reserving supplementary spaces on campus for additional fees. To receive rate for Groups 18 and younger, groups must consist of 5:1 ratio within that age bracket. In certain instances, flexibility may be afforded to smaller groups depending on facility usage and event demands. For more information contact Andrew Winscot, Assistant Director of Campus Recreation at winscotas@unk.edu or 308-865-8849.